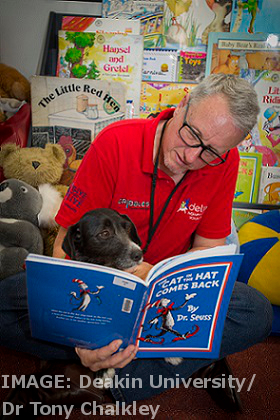 A well-regarded researcher, lecturer and former primary school teacher, Deakin University’s Dr Tony Chalkley is also the owner of a Delta Society-certified therapy dog named Squirt. Tony and Squirt have toured primary school classrooms and witnessed some remarkable changes when children read books to Squirt. “It's a little bit magical the way kids who are normally reluctant readers line up to read with Squirt the therapy dog,” says Tony. “The simple act of patting and talking with the dog triggers the desire to share stories from the children's own 'pet history'. Often, Tony says, the floodgates of literary interest are flung open. To find out why he has proposed a 12-month field study - named Read2Spot - to better understand the role and value of therapy animals in the everyday school life of children. Dr Chalkley’s mission to fund Read2Spot is being run on Pozible. He is seeking to raise just $8,400 to cover expenses like travel costs for therapy dogs, Honours students for project support, the purchase of reward stickers for kids and, of course, Shmackos for canine workers like Squirt. The campaign ends on June 5. The resulting data will be used to support existing pet and animal therapy programs, improve and expand the training of handlers, and develop new and innovative ways to develop literacy skills in the classroom.